With this tour you will first start by riding a ferry that will take you to the Izu-Oshima. Izu-Oshima is an island that is part of Tokyo, however it differs greatly due to the rich nature and wild life. On this tour you will be able to experience the great nature and also experience diving in the ocean of this volcanic island. You will have free time after the diving, and on your back to Tokyo, you will be riding a high-speed jet ferry. Speaking of Tokyo, you would firstly think of the scenery in a busy and glittering metropolis including Shinjuku, Shibuya or Roppongi. While, in Tokyo, there are also remote islands surrounded by a lot of beautiful nature. In this tour, you will discover Izu-Oshima, one of those islands in Tokyo. 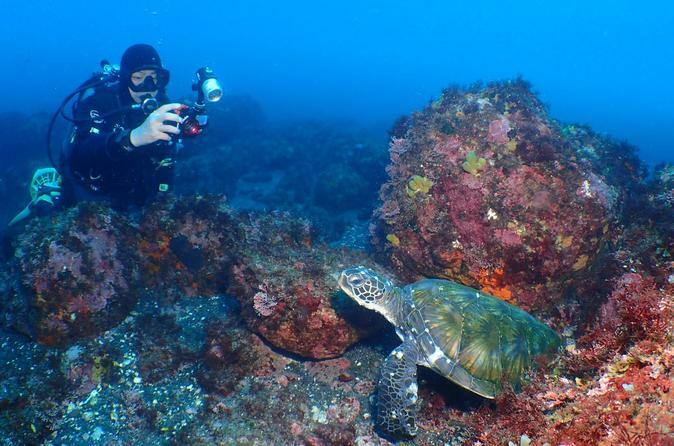 This program is only for people who hold Diving license, and the experienced diving guide will take you to the dynamic ocean of Izu-Oshima, a volcanic island. Izu-Oshima is the largest of the Izu Islands located 120 kilometers south of the capital Tokyo. The climate there is warm all the year around due to the impact of the Kuroshio Current, and you will be greeted by the distinctive landscape formed from the terrain unique to a volcanic island having the Gojinka (volcanic eruption) as known as the Mt. Mihara at the heart of the island. The rich nature and unique landscape of the island is spread out, that you can’t imagine from the location shown on the map, nor believe it’s in Tokyo. In 2010, it has been added to the list of Japan Geoparks as the first place in Kanto region for the reason ‘Through the volcanism of an active volcano Mt. Mihara, we can learn the relationship between the nature and the earth with fun.’ Various sceneries of the nature created by the volcanic activities would please the eye. Izu-Oshima is also famous for around 3 million Yabu-Tsubaki (Camellia flowers) grows in the island. Tsubaki Festival is held from late January to mid March every year.